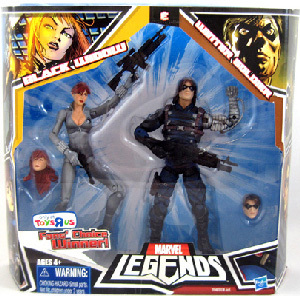 Description Of Item: Hasbro Marvel Legends 2-Pack Exclusive: Black Widow and Winter Soldier Variant. When the most important battles need to be fought, call on the greatest warriors with our Marvel Legends 6 inch Action Figure 2-Pack - Black Widow and Winter Soldier! Create a nearly unstoppable team with you and your Black Window and Winter Soldier action figures. Featuring carefully crafted details to make the action even more realistic, these two are ready to take on whatever trouble comes their way. Begin the battle and fight to win!